This stunning example of the Audi Q5 is fitted with the S-Line styling pack which features an upgraded body and leather S-Line seats. Included with this Q5 are Satellite Navigation with Traffic Reports, Parking Sensors for the front and rear, DAB Digital Radio, Bluetooth telephone and media use, WLAN connectivity, an automatic Start/Stop system, Hill Assist and Cruise Control with a speed limiter. Also featured on this Q5 are Audi Jukebox with up to 20GB storage, a multi function S-Line Steering Wheel with paddle shifters, electric folding Door Mirrors, front and rear Arm Rests and Drinks Holders. This car has been well loved and maintained by its only owner. Boasting coupé-like styling combined with an elevated driving position, spacious interior and plenty of ground clearance, the Audi Q5 is the perfect vehicle for drivers who require a car that's as flexible as they come. As much at home in the countryside as it is in the middle of a city, the Q5 is designed to fit in with your lifestyle. 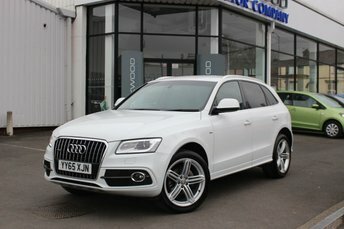 Why not come and test drive one of the used Audi Q5 models for sale in Manchester at Oakwood Motor Company Ltd? We have pre-owned vehicles to suit all budgets and you can be sure of finding a model that meets your requirements. Feel free to contact a member of the team by phone, online or in person to find out more.